Dr. Sunghwan Shin was born in South Korea, where he started his academic career with a B.Sc. at the Department of Chemistry at Seoul National University, Seoul, in 2007. Afterwards, he started a Ph.D. at the same department, which he completed in August 2017. Dr. Shin has received several awards for his work such as the Best Doctoral Thesis Award and the Outstanding Teaching Assistant Award from Seoul National University as well as the Best Poster Prize by the Chemical Society of Japan. He was the first foreign student to win this poster prize. 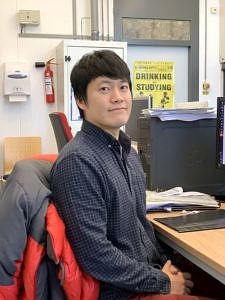 Dr. Shin´s research interests include the development of a nanocapacitor, which is a new experimental method for applying a strong electric field, electric field-induced dissociation of acid and phase transition of solid acetone films among others. Since January 2018, he conducts research at FAU´s Chair for Physical Chemistry II as a Humboldt Research Fellow. FAU is a friendly place for international researchers. FAU has excellent people, who support foreign students and researchers like the Welcome Centre and the staff in the department. They will welcome you like a family. What exactly sparked your interest in this field of research? Originally, my interest in physical chemistry came from the curiosity about the world. When I learned about acids during middle school, I could not understand why only small amounts of water molecules dissociate in this pure liquid. At that time, I could not find a satisfactory answer so I decided to study chemistry. Nowadays, as an experimental physical chemist, I keep trying to understand why chemical reactions happen. Ionic liquids are interesting liquid materials because they consist of ions, not neutral molecules. Many physical and chemical properties of ionic liquids are therefore quite different from those of other liquids. At FAU, I am studying the properties of ionic liquids at charged interfaces, based on surface science approaches. Generally, surface or vacuum techniques are not easy to utilize for the study of liquids due to the evaporation of liquids that are exposed to vacuum. However, an ionic liquid will not have this problem due to its really low vapour pressure, therefore the amounts of evaporated molecules are negligible inside a vacuum. Using this advantage, I try to unveil the interfacial properties of ionic liquids with powerful surface science techniques. With their unique properties, ionic liquids have numerous potential applications like as a battery, sealant or green solvents. My research about the fundamental properties of ionic liquids will be useful for these applications. I am planning and managing the research projects with my colleagues. FAU has many good researchers in the various fields and I can receive a lot of useful feedback from them. I also do experiments with Ph.D. students. We discuss experimental data and try to improve our research together. At the moment, I am preparing to set up new experimental equipment for Humboldt projects. FAU is an international place where it is possible to find researchers coming from all over the world. What would you say to students or young researchers who are considering to choose FAU for a stay abroad? I would say that FAU is a friendly place for international researchers. FAU has excellent people, who support foreign students and researchers like the Welcome Centre and the staff in the department. They will welcome you like a family. Don’t worry to choose FAU. How well known is FAU internationally in your field of research? FAU has a remarkable reputation in the field of surface chemistry. Especially, my host Prof. Steinrück, who holds the Chair for Physical Chemistry II, is a well-known expert for many fundamental surface studies including porphyrins, graphene, and ionic liquids. FAU is an international place where it is possible to find researchers coming from all over the world. During the research and teaching, I had many chances to conversate with them and share different cultures. It was a really new experience for me. Another impressive difference is the experienced staff in the institute of physical chemistry. I received a lot of support from them fixing electronics and designing the vacuum instrument. It was one of my wish lists during my Ph.D. course in Korea. When I arrived at Erlangen, a large forest around the area was quite surprising and scary. It looks like a forest in Grimm’s Fairy Tales. I asked our secretary about the existence of a dangerous wolf, and she answered that a squirrel is the most dangerous animal in this forest. I love to visit the Dechsendorfer Weiher in Erlangen, where people enjoy water sports and ice skating next to a forest. My daughter likes to watch ducks in this pond. I strongly recommend visiting this place. I appreciate Prof. Steinrück and Dr. Florian Maier from the Chair for Physical Chemistry II for giving me a great opportunity to research at FAU. I also would like to thank my colleagues supporting me. With their warm helps, I enjoy Erlangen without any problems. Thank you for the interview, Dr. Shin.